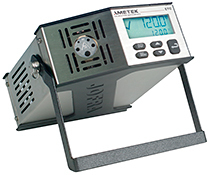 Rugged construction, featuring stainless steel and rubber side panels, make the instrument suitable for many years of service in an industrial environment. 124004 Shoulder Strap with Hooks. 123958 RS232 Cable with Stereo Jack Connector (2 meter) – Used for adjustment only.